If Tim Burton was a video game developer then Little Nightmares would be his fever dream. This dark indie puzzler was one of the most anticipated games of 2017 and I’m happy to report that it didn’t disappoint. Little Nightmares (much like obvious inspiration INSIDE and Limbo) features a lost child attempting to escape a hostile and nightmarish environment. The storytelling is worked into the complex puzzles and braided neatly into the oversized environments around you. The contextual details may be vague, but one thing is clear. Our protagonist nine-year-old Six must escape. Little Nightmares is a 3D side scrolling game and that extra depth compared to its 2D counterparts allows for a more immersive gameplay experience. Six (wearing her yellow raincoat) appears as a beacon of hope in this gloomy world. For a long period of time, her raincoat and lighter are the only symbols of light. Playing in the shoes of a child makes us more compassionate towards her, which in turn causes us to be shocked at some of her more questionable actions as the game progresses. Tension is built successfully in Little Nightmares by a variety of tactics. Visually, areas that are drenched in darkness make us pray that our little lighter doesn’t run out of fuel, whilst the superb sound design elicits a sense of foreboding and something lurking in the darkness beside us. The environment of the Maw is littered with both safe rooms and areas filled with danger allowing Six to both playfully explore the environment in peace and be hunted in other sections. The enemies (each ghastly in their own way) all have different tactics when it comes to hunting Six, most of them relying on one sense (be it sight, sound or smell) to capture our protagonist. Different chapters focus on a different foe forcing us to forget what we learnt in previous chapters as we change up our gameplay style to survive whilst moving through the game. Fiendish puzzles are commonplace inside the Maw and the presence of enemies means that Six will have to be more than just clever to survive the various foe filled rooms that she comes across in her escape attempt. The one negative in this game is that Little Nightmares struggles with is its cumbersome controls. At times where precision jumps are a matter of life of death, a slight error in angle means that Six will fall to her demise. This paired with lengthy loading screens to rival Bloodborne and erratic checkpoints means that death becomes more exasperating than frightening. 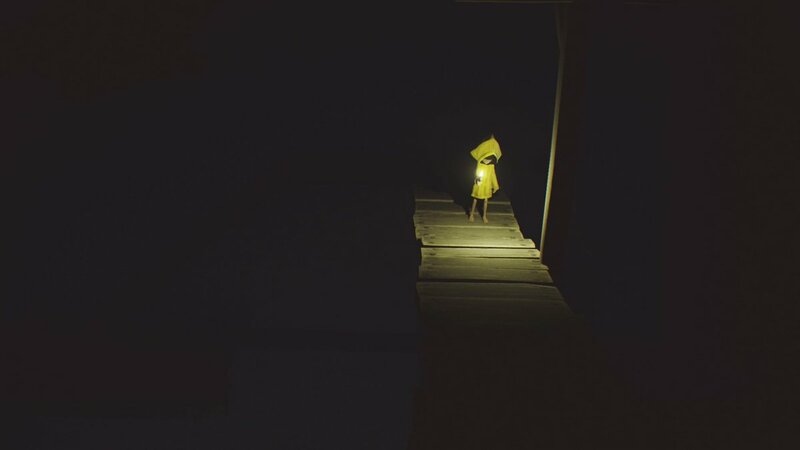 The horror elements in Little Nightmares are made mostly through subtle changes to the environment and unsettling noises that radiate through the more dangerous areas of the game. Jump scares are kept to the minimal and their absence and then sudden reappearance makes for an uneasy gaming experience. Little Nightmares does an excellent job of keeping you worried about what’s around the next corner by playing on genuine childhood fears: monsters under the bed, dark corners, and unclear adult motives. The build-up and climax of Six’s story is one of memorable horror. Excusing some of her more erratic behaviour as an attempt to survive it becomes much harder to sympathise with our raincoat wearing protagonist. The ending is shaped beautifully with a copious amount of shock that leaves you wanting more story than the game delivers, leaving us anticipating the three DLC’s that will hopefully uncover the secrets of the Maw. A short and not so sweet game that concludes around the five-hour mark, Little Nightmares ties elements of psychological horror together with touching segments of childlike calm to make a well-rounded game. Little Nightmares offers up a thrilling experience, one that leaves us scratching our heads for a long time after the game is over. Want more Little Nightmares content? Read my reviews from The Secrets of The Maw DlC drop here!